The 1920s-themed speakeasy bar Lock & Key is now open in K-town, behind a signless red door at the Stall 239 food window, which is dishing up Taiwanese fried chicken, kalbi kabobs and pastrami sandwiches. Once you're in, a hostess in a roomful of locks and doors ushers you into the dim black-and-gold bar featuring booths and handcrafted cocktails by Christophe Namer (Pastis). Lock & Key/Stall 239, 239 S. Vermont Ave., Los Angeles, CA 90004, 213-389-5625. Restaurateur/entrepreneur Michael Zislis (The Strand House) has transformed his previous Mucho Ultima Mexicana into Circa in Manhattan Beach, with Octavio Becerra (Palate Food + Wine) helming the stoves. Becerra's menu of global dishes features arancini with persimmon marmalade; octopus carpaccio with charred dates and kumquats; bone marrow with kimchi and quail egg, and crispy pork belly with carrots. Julian Cox (Rivera, Picca, Bestia) and Josh Goldman (ink.) create an inspiring cocktail program with house-made ingredients like smoked Coke and violet. Circa, 903 Manhattan Ave., Manhattan Beach, CA 90266, 310-374-4422. Spazio Caffe has opened in Santa Monica. This Italian coffeehouse offers a light menu plus espresso and espresso-based drinks, dozens of teas and hot chocolate in 18 different flavors. Spazio Caffe, 1511 Montana Ave., Santa Monica, CA 90403, 310-899-6769. Michael's Pizzeria, which has locations on Naples island in Long Beach and Rancho Mirage, has opened a third location in downtown Long Beach. Michael's Pizzeria, 210 E. 3rd St., Ste. C, Long Beach, CA 90802, 562-491-2100. We're not sure if the chickens have come home to roost at Barnyard, now open in Venice, but chef Jesse Barber --- who trained with Thomas Keller at The French Laundry and recently comes by way of The Tasting Kitchen --- has. His local, seasonal Mediterranean menu includes braised baby octopus with fresh chickpeas, salt-roasted prawns with wilted leeks, kale salad with shaved sunchokes, and lamb with seared escarole. Expect a chic wine list, too. Dinner Tues.-Sat. 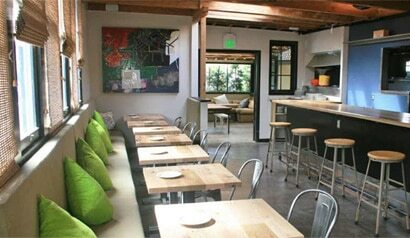 Barnyard, 1715 Pacific Ave., Venice, CA 90291, 310-581-1015. Ozumo Santa Monica has morphed into an izakaya-style restaurant, Bamboo Izakaya, moved to an oceanfront space, and introduced a new interactive iPad service, in which guests can see images of the dishes on the menu before placing their order. Expect Caprese salad with tomatoes, mozzarella and shiso in a yuzu vinaigrette, a cheeseburger croquette with panko, ground beef and mozzarella cheese with a sweet chili ranch sauce, and robata items like miso salmon, as well as kushiyaki skewers, a selection of sushi and sashimi options, and signature house rolls. The Ozumo sake and bar program will remain the same. Lunch & Dinner daily. Bamboo Izakaya, 1541 Ocean Ave., Ste. #120, Santa Monica, CA 90401, 310-566-3860. Tinhorn Flats, Burbank's oldest watering hole, famous for its Western vibe, has opened a second location in Hollywood. Serving breakfast, lunch and dinner, the menu features saloon specialties like homemade chili, pork chops, barbecued baby back ribs, and s'mores crème brûlée. All-day breakfast includes rib-eye steak and eggs and huevos rancheros. A full bar offers cocktails, wine and beer. Lunch & Dinner daily. Tinhorn Flats, 1724 N. Highland Ave., Los Angeles, CA 90028, 323-462-2210. The Moroccan restaurant Asha has opened in Long Beach. Menu items include classic appetizers like pastilla, cigars and spicy hummus, chicken, beef and lamb tagines, and entrees ranging from kabobs to filet mignon. Lunch & Dinner daily. Asha, 149 Linden Ave., Long Beach, CA 90802, 562-628-2255. Jason Segal, a former SBE chef and protégé of Roy Yamaguchi, is part of the opening team at modern, casual Village Fish Market in Calabasas. The fish market/café offers everything from fish and chips to grilled King salmon to uni-topped oysters. Lunch & Dinner daily. Village Fish Market, 26791 Agoura Rd., Calabasas, CA 91302, 818-871-0500. A.O.C., the popular wine bar owned by acclaimed chef Suzanne Goin and business partner Caroline Styne, has re-opened in its new location. Expect small plates like pork cheeks with polenta, mustard oil and gremolata, along with "platters" of whole grilled fish with tomato rice, fried egg and crispy sopressata. A.O.C., 8700 W. Third St., Los Angeles, CA 90048, 310-859-9859. Pasadena's redwhite+bluezz, a popular American bistro and jazz club, has departed Old Pasadena (70 S. Raymond Ave.) and is slated to reopen next to the Pasadena Playhouse March 8, in the space most recently occupied by Elements Kitchen. Sous chef Alfonso Galan has been promoted to executive chef in the new digs. Dinner will be served Tuesday through Sunday, with brunch on Sunday. redwhite+bluezz, 37 S. El Molino Ave., Pasadena, CA 91101, 626-792-4441. The Mixing Room, the cocktail lounge at the JW Marriott Los Angeles L.A. Live, has debuted a new cocktail and bar bites menu. New items include rare whiskeys, seasonal signature cocktails, barrel-aged cocktails and creative snacks. Current offerings, which change monthly, include the house Manhattan with barrel-aged bourbon, Carpano Antica vermouth and Angostura bitters; and the Yerba Buena with Tapatio Blanco tequila, cilantro, jalapeño and lime juice. Among snacks are fish and chips with house-made tartar sauce and malt vinegar aïoli; and Kobe beef "Reuben" sliders. The lobby level lounge opens at 4 p.m. daily. The Mixing Room, 900 W. Olympic Blvd., Los Angeles, CA 90015, 213-765-8600. The team behind Hostaria del Piccolo and Piccolo Ristorante are working on a new restaurant concept that will be called CiBOTECA. It will open near the original Hostaria del Piccolo in Santa Monica. Hostaria del Piccolo, 606 Broadway, Santa Monica, CA 90401, 310-393-6633. Sherry Yard has left Spago Beverly Hills to open her own bakery at the old Helms Bakery space in Culver City. Yard plans to open the bakery next September; her replacement at Spago is Della Gossett, formerly of Charlie Trotter's. Spago Beverly Hills, 176 N. Canon Dr., Beverly Hills, CA 90210, 310-385-0880. Santa Monica gastropub The Yard has closed and will be replaced by The Craftsman Bar and Kitchen. The Yard, 119 Broadway, Santa Monica, CA 90401, no phone. The iconic New York hot dog stand Papaya King, imported by SBE two years ago, has closed on Wilcox in Hollywood and will be replaced by a new SBE bar that will be part of the company's Sayer's Club brand. The menu will purportedly be created by chefs Danny Elmaleh and Michael Teich from Cleo. Papaya King, 1645 Wilcox Ave., Los Angeles, CA 90028, no phone. A rent increase is forcing Venice fave Jin Patisserie to leave its Abbot Kinney digs, but owner Kristy Choo is currently looking for a new location. The last day of operation will be March 24, 2013. Jin Patiserrie, 1202 Abbot Kinney Blvd., Venice, CA 90291, 310-399-8801. True to its moniker, Rolling Stone Los Angeles has gathered no moss and is now closed, leaving its former space in the Hollywood & Highland complex listening to the sound of silence. A new concept is expected to replace it sometime this summer. Rolling Stone Los Angeles, Hollywood & Highland, 6801 Hollywood Blvd., Hollywood, CA 90028, no phone. The original location of Adam Fleischman's Umami Burger has closed. There are several other branches in the Los Angeles area, including Hollywood, Los Feliz and Santa Monica. Umami Burger, 850 S. La Brea Ave., Los Angeles, CA 90036, no phone. Wurstkuche in Venice suffered damages when a truck hit the facade of the building on February 10, 2013. Police had allegedly been in pursuit of the vehicle. After a brief closure, the restaurant has re-opened and will continue operating during reconstruction. 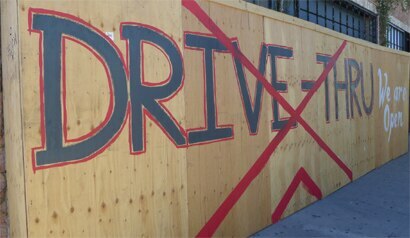 Covering part of the exterior is a wood panel painted with the words "We Are Open" and, as a tongue-in-cheek message, "Drive-Thru" with a big red "X" over it. Wurstkuche, 623 Lincoln Blvd., Venice, CA 90291, 213-687-4444. Charlie DiLorenzo's Malibu restaurant Charlie's has closed. Charlie's, 22821 Pacific Coast Hwy., Malibu, CA 90265, no phone.